At Perfectly Beautiful, of course, our clients are at the heart of everything that we do. Firstly, we specialise in bringing a unique element to formal hair styling for our beautiful girls. Secondly, on top of making you feel and look amazing, we bring an element of fun, friendliness and calm to the atmosphere. Lastly, you and your girlfriends will be left feeling extremely relaxed, glamorous and joyous. Our Unique Formal Hair Styling Process. We offer a free, no obligation consultation service via phone, email or in person. Therefore, we connect and discuss the event you are preparing for. Our team covers the overall desired look you are aiming to achieve, the theme you have in mind and talk about every requirement you have. To sum up we discuss options that might be suitable if you aren’t sure what you are after. In this case, we can cater for all kinds of styles so are open to any photographic samples or magazines that you have as inspiration. Our amazing team, work with ladies anywhere from Brisbane, Toowoomba, Gold Coast, Sunshine Coast across South East Queensland. A formal hair styling trial is something formal attendees often invest in. It is a fantastic way to experiment with different looks ahead of the actual event. This way you can have peace of mind knowing that there will be no surprises on the day. Don’t however, feel pressured to schedule a formal hair styling trial. We understand that not everyone needs or wants one ahead of their formal. Besides, if by any means you do decide against doing a formal hair styling trial run, you can rest assured that your formal hair styling done by Perfectly Beautiful on the day will be just that, perfectly beautiful. On top of professional formal hair styling, Perfectly Beautiful are experts when it comes to panic control and time management. Formal events can often be chaotic. Ultimately we can help alleviate some of the stress that comes along with beauty preparation for such a big event. Our reliable and fully mobile team will come directly to your home, hotel room or formal venue. As a busy lady, you don’t have to worry about travelling or needing to get to us on time on your big day. We’ll come prepared and have all of our formal hair styling products and tools with us to accommodate for any-sized group. Whether it’s just one person or an entire formal group, our team are there for you. We’re here to help and to make your big day perfect. Please see below a list of frequently asked questions about our formal hair styling service. Regardless of the questions you have, we’d welcome your enquiry and would love to talk to you. 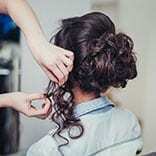 Why should I hire a professional formal hair stylist for my big day? The products we use are premium (not your average everyday consumer brand products). This means that not only will the products not irritate your skin and look amazing, but they will also last for the duration of your special day. We take away the risk of doing it yourself. We’ve done this for a countless number of ladies on their special day. After all, we know the tips and tricks to ensure you are looking and feeling your best on your big day. Our experience and training has far passed what is taught in cosmetology school. With over a decade of experience applying makeup, you can be sure that your makeup will last all day and look amazing in your photos. Additionally, we take the stress out of the day. We come to you and eliminate the idea of having to travel to look good. Time is limited on your big day and we want to ensure that you spend every minute of it doing something that will make you feel and look fantastic. As a team, we bring our entire suite of products with us to make life easy. Furthermore we provide a fun, enjoyable and relaxing experience. We help with time management and overall ensure that the vibe is positive and stress-free. What brands of hair styling products do you use? Our artists have invested years of product research and testing to develop the perfect hair styling solution for specific needs. The products we use are premium brands which that have been designed to give long-lasting results as well as photograph beautifully. We have invested thousands of dollars with a range of professional retailers to get the high end products that we use. Note: You will not typically find these brandish general stores. Please contact us if you would like more information on the brands we use. Do you do formal hair styling trials? We sure do! Sometimes it’s best to have peace of mind knowing the exact look and feel you will have on your special day. Plus it’s a great excuse to get your friends and family together for a fun pre-event. 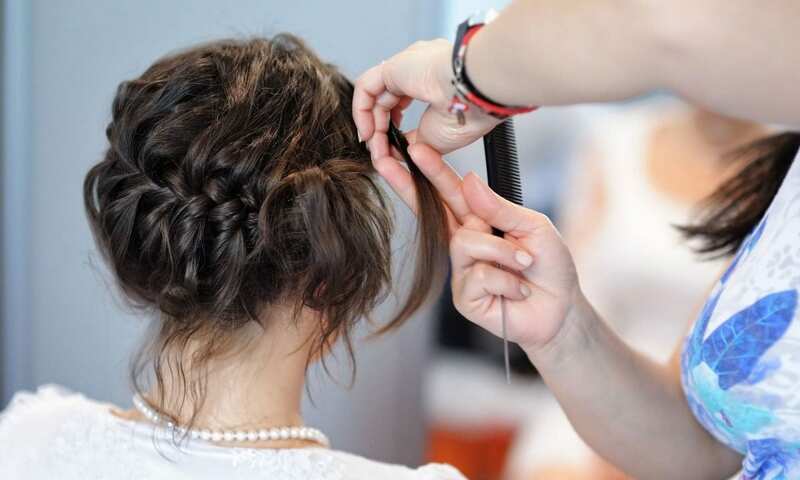 Our formal trial hair styling service is generally up to 1 hour long. However, depending on who you need the trial for will depend on the timing and the price. Please contact us to discuss your formal hair styling trial requirements. Do I really need a formal hair styling trial? It’s a very common service we find amongst many formal attendees. In saying that, if you decide you can’t do a trial, you can be assured that we will work closely with you prior to the event. This is to ensure that we have the exact style, look and feel you want to achieve for the day. Firstly, we add personality and fun to the mix. Our team understands how important it is to make sure you look perfect on your big day. At the same time, we also know how important the vibe is to making a great pre-event atmosphere. Secondly, we add sparkle to your event by providing a fantastic service. In conclusion, matched with a stress-free, positive and friendly approach.